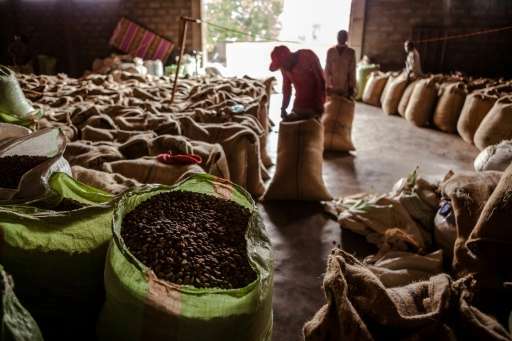 "A 'business-as-usual' approach could be disastrous for the Ethiopia coffee economy in the long-term," said Justin Moat, a professor at the University of Nottingham and lead author of the study. But the new research uncovered a silver lining: a timely and well-planned transition to other regions could not only save the country's largest source of export revenue, it could quadruple land under cultivation, the researchers found. Home of the prized Coffea arabica plant, Ethiopia is the world's fifth biggest producer of beans, after Brazil, Vietnam, Colombia and Indonesia, according to the International Coffee Organization. The sector employs some 15 million people and accounts for a quarter of the east African nation's foreign earnings, around $800 million (715 million euros) annually. Over the last 50 years, however, average temperatures across the country have risen by about 1.5 degrees Celsius (2.7 degrees Fahrenheit), and rainfall in key regions has become spotty. Coffee areas that once flourished are in decline, dozens of farmers told the researchers over the course of a three-year investigation. "All but a few reported that there had been changes in their local and regional climate, including an increase in unpredictability of the seasons," co-author Aaron Davis, a scientist at the Royal Botanic Gardens in Surrey, England, told AFP. Over decades, the farmers had also seen less rain, combined with a longer and more intense dry season. The oldest among them remembered good harvests every year six or seven decades ago, and every three years toward the end of the 20th century, said Davis. Today, bountiful harvests in some key areas happen only once every five years. One of the country's best known coffee regions, Harar, is likely to disappear before the end of the century, the study forecast. The study calculates that coffee production must move up in elevation some 32 metres per decade "to keep pace with climate change." Currently, coffee is grown between 1,200 and 2,200 metres (4,000 and 7,200 feet). Climate models projecting changes driven by global warming across all 16 of Ethiopia's coffee growing regions matched the historical data, bolstering confidence in their accuracy. Fortunately, the potential to migrate coffee farms to higher ground exists. Even if much of the nearly 19,000 square kilometres (7,300 square miles) currently under cultivation becomes marginal, there is more than twice as much suitable land—much of it forested—that could take its place. "It is going to be a massive undertaking—there is time to make the necessary transitions if we start now," said Davis. "But if we wait, it will only become more difficult and more traumatic." Enter the new science of media speculation. Climate change gives me a hairball. This is more climate change garbage/hype which can be now attributed to science junk writer Marlowe Hood. Read the Abstract and see what an exercise in garbage this is, "modeling approach in combination....". In order to get published it must be a requirement for the Abstract to state "Against a backdrop of rapidly increasing temperatures and decreasing rainfall, there is an urgent need to understand the influence of climate change on coffee production." Marlowe did you at all think of a fact check of "rapidly increasing temperatures and decreasing rainfall"? How very unprofessional.